Lucasfilm unveiled exclusive footage from The Mandalorian at Star Wars Celebration; it hasn't been released online, but here's a full description. The Mandalorian is one of the most exciting Star Wars projects in the works right now, the very first live-action TV series set in the galaxy far, far away. 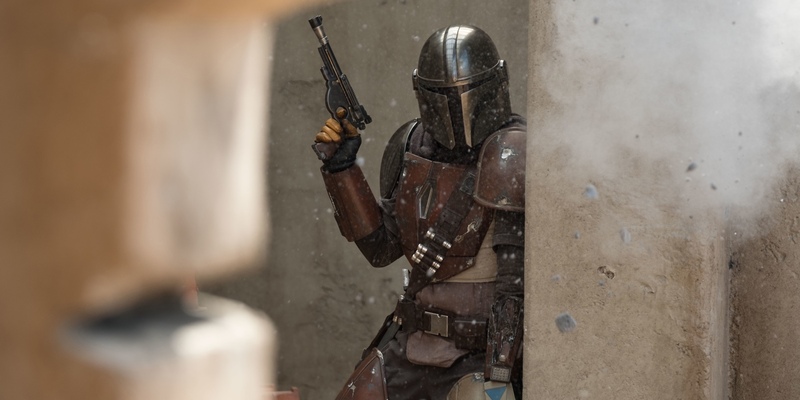 Both Lucasilm and Disney clearly believe they're onto a hit with The Mandalorian; it's been confirmed that the eight-episode series will premiere on on November 12, with the launch of Disney's new streaming service, Disney+. Sadly, it seems that's far too distant for Lucasfilm to drop a trailer just yet, but they did reveal some footage for the audience at Star Wars Celebration. The footage begins with the Mandalorian talking to Greef Marga, head of a chapter of the Bounty Hunters Guild. The Mandalorian is looking for a mark, and initially attempts to take every single mission Greef has at the moment. He's told to hold on; as Greef notes, there are other members of the Guild who have to make a living as well. Instead, Greef offers one unique jump, a face-to-face commission. Precious little information is provided about this job, but the Mandalorian accepts it regardless; he has to make ends meet, after all. After accepting the commission, the Mandalorian walks across a street market. In the background, a Kowakian Monkey-Lizard is being roasted while another watches from a cage. They're both real puppets. Another scene shows the Mandalorian meeting with an Imperial, who has been told he is "the best in the parsec" - even if he is expensive. Unwisely, the man seeking to hire the Mandalorian hasn't come alone, and his associate - a doctor - nearly winds up gunned down when he interrupts the meeting. The Mandalorian is tasked with bringing someone in alive; if his target dies, he'll need to provide proof of termination, but will be paid a lower fee. Curiously, the data and codes he's provided in order to accomplish this mission are 50 years old. The Imperial makes the case for the Empire being better than the chaotic status quo, arguing that the Empire brought safety, prosperity, and peace. It's a brief digression, but it indicates there's going to be a real-world political slant to The Mandalorian; that particular sentence structure has been used by Donald Trump on occasion. The footage also included a range of action scenes, several featuring the Mandalorian and Gina Corano's Kara Dune. Dune is an ex-Rebel shock trooper who's acclimatizing to life after the end of the war with the Empire, and she appears to be able to match the Mandalorian blow for blow in one fight scene. One crowd-pleasing moment saw the Mandalorian using a rope launcher to pull a Storm Trooper to him, then shocking someone close-range with a pulse rifle. Finally, Kara was shown using a Gatling gun on an unknown ship. No context was provided for any of these scenes. It's a shame none of this footage was made available online, but there are probably good reasons for it. First of all, Lucasfilm want there to be some advantages to having paid for a ticket to attend Star Wars Celebration. Secondly, given The Mandalorian won't be released until November, it's possible these scenes aren't quite finished yet. Computer effects could well be added through post-production, meaning they aren't ready for distribution online, where they'd be pored over by fans with HD screens. It's exciting to see the Bounty Hunters Guild become more prominent in the Star Wars canon again, with Greef managing a local branch. The Guild was an important part of the old Expanded Universe, prominently featured in the Tales of the Bounty Hunters anthology, but has only had a background presence in the post-Disney canon. It seems the Mandalorian is registered with the Guild, and is eager to go for their highest-paying jobs. At this stage, it's unclear whether this Imperial mission will be the focus of the full eight-episode series, or whether each episode will feature a different mission. At The Mandalorian panel, Dave Filoni and Jon Favreau stressed that the series would tie into the original trilogy, the prequels, and the sequels. That perhaps explains why the Mandalorian has been hired for a mission that seems to run back decades, into the history of the Star Wars galaxy. He's provided with codes that are 50 years old, possibly predating Star Wars: The Phantom Menace. Given that the Empire is in retreat by the time of The Mandalorian, it'll be fascinating to see why they're even interested in somebody - or something - who was important before Palpatine rose to power in the first place.